In 1891, the family lived at Cockfield, in 1901 at Main Street and in 1911 no specific address is given. Norman’s father Robert worked as a shoemaker then a boot repairer. Norman worked as a colliery banksman. The following account will concentrate only on the action of the 49th Division. It commenced its march from its assembly areas east of Ypres at about 7pm in order to arrive at the jumping-off positions by midnight. The Ravebeke, a little canal shown on the maps to be only 5ft. wide that day spread to 150ft. with water waist deep in the centre and one of the 2 brigades (presumably the 148th) did not cross it. The 146th Brigade crossed further north and advanced several hundred yards to be hit by shrapnel and heavy machine-gun fire from pill-boxes on the higher ground. “9th and 10th: The Battalion was ordered to attack the PASSCHENDAELE RIDGE in conjunction with attacks by the 1/7th and 1/8th Bns West Yorkshire Regiment on the left and the 148th Infantry brigade on the right. The frontage allotted to the Battalion was 280 yards, the centre of the Battalion frontage (where the battalion assembled) being a point about 500 yards East-North-Eastof CALGARY GRANGE D.9.a.9.4. The attack was on a compass bearing of 58⁰ true. The formation adopted by the Battalion for the attack was “A” and “C” Coys in the first wave, (“A” on the left and “C” on the right) to take the first objective: “B” and “D” Coys in the second wave (“B” on the left, “D” on the right) to leapfrog through the first wave and take the second objective. Companies adopted the formation of lines of sections for the attack. ………..
Punctually at 5.20am the Battalion advanced from the assembly position behind the barrage. The ground was extremely wet and cut up and great difficulty was experienced in keeping pace with the barrage especially in the crossing of the STROOMBEEK which was found to be a small stream adjoining a marsh about 200 yards wide…..The enemy barrage opened out within 5 minutes of Zero hour and fell heaviest on the STROOMBEEK and behind our assembly position on the north east end of CALGARY GRANGE. Few casualties were caused by the enemy barrage but the Battalion after crossing the STROOMBEEK came under machine gun fire and fire from enemy snipers who were able to fire through our barrage from pill-boxes and selected positions in shell holes, most casualties being caused by machine guns from BELLEVUE and YETTA SLOPES…. The first objective was completely taken by 6.40am and “B” and “D” Coys went forward to the second objective…….The enemy appeared to have held most strongly the slopes round PETER PAN and had machine guns at BELLEVUE…………………….No prisoners were taken by the Battalion. The enemy was identified as belonging to the 5th JAGER REGIMENT…. The attack appears to have been held up by the machine guns firing from the pill-boxes at BELLEVUE. Attempts were made to rush these pill-boxes without success…………. Information could not be got back from companies as we were close up to the enemy snipers and their observation from the higher ground made it almost impossible for the runners to get back………. Aline of detached forts running from the South edge of WOLF FARM to the Eastern edge of WOLF COPSE and along the south-east side of WOLF COPSE with a detached post about 150 yards South-east of the Southern corner of WOLF COPSE; a Support Line was established along the line of the limit of the first objective – about 200 yaards behind the line of forward posts. These positions were held until the night of the 10th October when the Battalion was relieved although several small Infantry and Bombing attacks were made on many of the advanced posts. 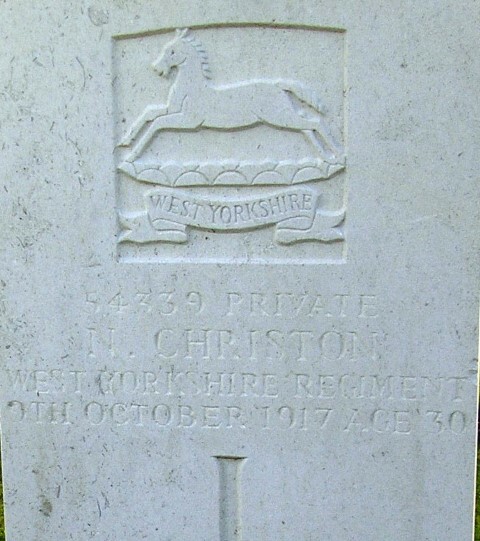 Private N. Christon was awarded the British War and Victory medals. Rifleman H. Hall 1/7 WYR, from Cockfield, buried at Tyne Cot Cemetery and commemorated on the Cockfield War Memorial. Corporal George Parmley, 1/4th battalion, the King’s Own Yorkshire Light Infantry, from Ramshaw, died of wounds 16 October 1917 and is buried in Wimereux Communal Cemetery, France and commemorated on the Evenwood War Memorial. 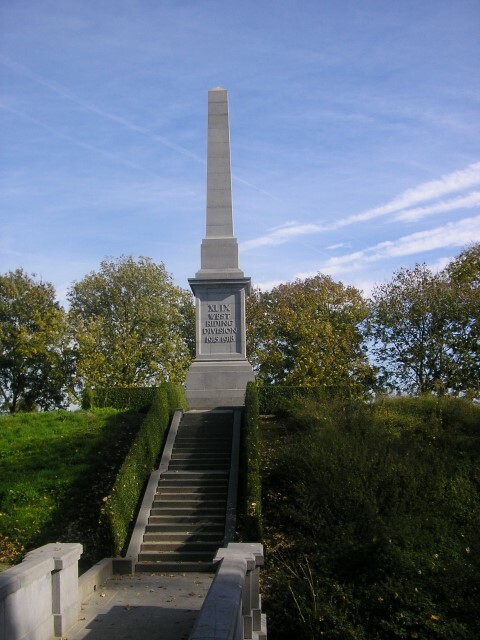 The Memorial Column to the 49th (West Riding) Division: Behind Essex Farm CWGC cemetery on the western bank of the Yser Canal, just to the north of Ypres (Ieper) is the Memorial Column to the 49th (West Riding) Division inaugurated in 1924.